A classic Mopar makes a lot of us pay attention. Of course the neon paint of this 1967 Dodge Coronet hardtop means it's going to be the kind of car we will never forget. So it's amazing you can be so memorable for such an affordable price. Let's start with the part that we all saw first, the paint. Mopar's High Impact color pallet is some of the most fun that came out of the era. Sure, Sublime wouldn't actually be out for a few more years, but it just looks right on this '67. It's because someone really took the extra time on this one. Not only does the green have a great, but also the details in black really make it look like a premium standout. There's a custom black stripe that starts at a power base and works its way up the hood, and then there is the mirror image on the trunk. The black and chrome rub strip highlights the profile, goes nicely with the upgraded Torq Thrust wheels, and makes us all take note of the Coronet's cool flared rear quarter panels. The premium vinyl roof shows off the angular hardtop, and it all ends in a sporty rear spoiler. It's a total package that is aggressive, premium, and overall striking. Inside the premium black continues. This Mopar seems to carry most of its original components from the seats, to the door panels, to the headliner - all of which have held up quite nicely for its age. The extra wide dash is pure '60s cool, and it has plenty of room for the long speedometer with plenty of room left over for the heat/defrost and factory AM radio. These were Dodge's intermediate cars, but you can see there's plenty of room to carry up to six total. 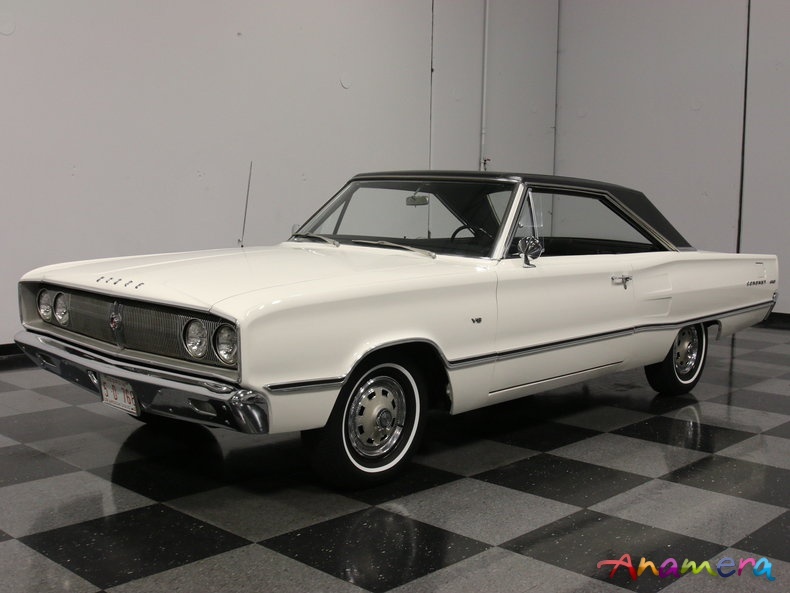 But no matter if it's just you, or a whole carload of family and friends, everyone will enjoy the look of rolling all the windows down and cruising in this pillarless hardtop. The green and black color scheme of this coupe even continues under the hood where the engine bay has been painted the glowing Sublime. That just makes the V8 look even meaner. The 273 cubic-inch looks great dressed in its Mopar Performance valve covers, but just as important, it has newer components like the alternator, master cylinder, and tidy wires & hoses to keep it running strong. Backing up this all-day enjoyment attitude is the effortless combination is the Torqueflite three-speed automatic transmission and power steering. But just because this is a nice car doesn't eliminate a bit of a wild side. The upgraded dual exhaust lets the world hear a hint of what V8 Mopar power is all about. An exceptionally bold coupe that's also been maintained correctly is an alluring proposition. So when it's this affordable, you know you have to hurry if you want it to be yours. Call today!! !